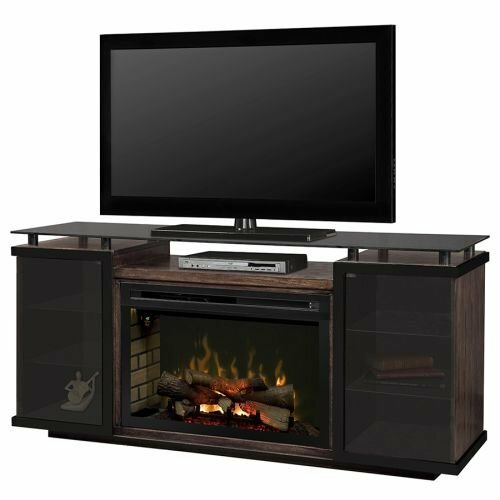 The contemporary design of the Aiden media console borders on modern with an industrial mix of earthy looking Peppercorn finished wood veneers, smoked glass doors and a top elevated by metal stanchions. The open media storage area allows for easy access to electronics with two adjustable glass shelves on each side of the unit offering even more space. The Aiden features a 33" Multi-Fire XD firebox with Logset Features: Finish: Peppercorn; Multi-Fire XD accurately reproduces a natural wood-burning fire, gas fireplace or a range of ambient light themes; Comes with real logs, meticulously selected firewood, charred and positioned against the back mirror; The exclusive gWave feature brings the fireplace to life with the wave of a hand; Includes a multi-function remote control and floating LED display for temperature setting, sleep timer and color themes; ECO mode reduces consumption by 33%; limits heat output to 750W for maximum efficiency and quieter operation; Heat boost function quickly warms a room by delivering maximum heat output for a pre-determined amount of time; No harmful particulates or emissions and 100% efficient; Plugs into any standard household outlet; Distressed Finish; Adjustable flame and temperature; Manufacturer's warranty: 1 year. Specifications: Overall Product Dimensions: 34.4" H x 71.6" W x 20" D; Product Weight: 300 lbs; BTU Output: 5118; Space Heating Capacity: 1000 Sq. Ft.; Voltage: 120 V; Wattage: 1500 W .
If you have any questions about this product by Dimplex, contact us by completing and submitting the form below. If you are looking for a specif part number, please include it with your message.